Key Difference: The LG Optimus L5 II and its counter part LG Optimus L5 II Dual are two entry-level smartphones by the company. The LG Optimus L5 II and L5 II Dual are quite similar to each other but differ in certain places, including looks. The device comes with a 4-inch True IPS LCD capacitive touch screen that offers around 233 ppi pixel density. The Karbonn Titanium S5 sports a 5.0 inch display with a resolution of 540 x 960 pixels. It runs on a 1.2 GHz Qualcomm Snapdragon Quad Core Processor and 1 GB of RAM. LG has recently added a new phone series to its line-up. 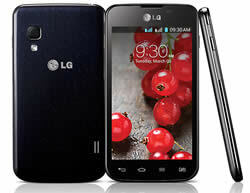 Following the original LG Optimus L series, the new phones include LG Optimus L3 II, LG Optimus L5 II and LG Optimus L7 II. 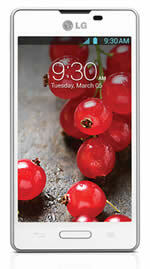 The LG Optimus L5 II and its counter part LG Optimus L5 II Dual are two entry-level smartphones by the company. Although review websites say that the company has managed another miss, many users disagree and have enjoyed the phone specifically because of its cheap price. The LG Optimus L5 II and L5 II Dual are quite similar to each other but differ in certain places, including looks. The Optimus L5 II has a bar format that has an oval hardware Home button on the front nestled right under the screen. This button is flanked by the Menu and Back capacitive buttons. The Optimus L5 II Dual, however, has four capacitive buttons Back, Home, Menu and the last button allows switching between the two SIM cards. The small design of both the phones is quite comfortable to hold and is also to use only with one hand. The buttons are also placed to make the device user friendly. The power button is placed on the right side of the device, while the left side houses the volume rocker and a customizable button that is initially customized to Quick Note. The 3.5 mm jack is on the top of the device, while the USB charging port is on the bottom. The back of the device has the camera on the left side along with the LED flash on the bottom of it. The loudspeaker grille can be found on the bottom right corner. The company has given the back a ‘fake’ metallic look that can be passed of for a metallic back from far away. However, the back is made of plastic and has a little cheap feeling to it. The hardware Home button on the L5 II has LED behind it that illuminates while charging and also lights up different colors for different notifications. The device comes with a 4-inch True IPS LCD capacitive touch screen that offers around 233 ppi pixel density. The screen has decent resolution and clarity for the price. The phone is quite light and weighs around 103 grams for both models. Both the models come with Android 4.1.2 Jelly Bean out of the box and have been customized by Optimus 3.0 UI. The major difference between the two devices is the L5 II Dual’s ability to support dual SIM cards. Both the devices are powered by 1 GHz single core processor, that results in lag if playing high-res demanding games. It also offers 512 MB RAM. The phones come with 4 GB internal storage capacity, of which only 1.75 GB is available to the user but, it can be expanded by 32 GB using a microSD card. The 1.75 GB still results in very less memory as Jelly Bean does not allow users to shift apps to the SD card. Both the devices come only with a 5 MP primary camera with a LED flash. The camera offers basic features such as geo-tagging, shot modes and a Cheese Shutter (that takes a photo when users say cheese). The camera also have VGA video taking capability. The phone is powered by a removable Li-Ion 1700 mAh battery, which the company touts provides almost 10 hours of talktime on 3G network. The company has also provided with 50 GB of cloud storage and L5 II Dual offers a very cool feature known as On Screen Phone. This feature allows the phone to connect to a computer using USB or Wi-Fi, the user can then completely control the phone using the mouse and the keyboard. The application comes in the form of the phone on the screen and the user can also control the volume as well as the power buttons. The feature is a benefit for people that work on their computers continuously. 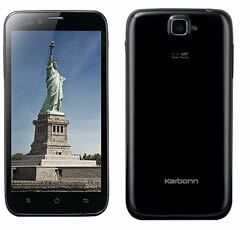 Karbonn has released its own quad-core phone: the Titanium S5. This is the company’s successor to the Titanium S1. The Karbonn Titanium S5 sports a 5.0 inch display with a resolution of 540 x 960 pixels. It runs on a 1.2 GHz Qualcomm Snapdragon Quad Core Processor and 1 GB of RAM. It is a Dual-SIM phone that comes with Android OS v4.1.2 (Jelly Bean). It also has an internal memory of 4 GB. The phone has an 8 MP primary camera and a 2 MP secondary camera. The phone comes with a limited amount of basic features and also includes CLID with Photo and Karbonn Apps Plaza. There are no high-end features to the camera, but it does manage to take a decent picture. If a person is looking for a no-nonsense phone with the basic purpose of clicking pictures, making calls, having a video conference, this phone is perfect. The best part, it has a very low price tag of just a little of INR 11,000, making it perfect for the people that do have expensive budgets. The information for the detailed table about the two phones has been taken from the LG website, Karbonn website, flipkart.com, snapdeal.com, fonearena.com and GSMArena.com. Wi-Fi, Browser, Bluetooth, PC Sync Application, USB, Modem Function, On Screen Phone, Video Streaming, USB tethering.